Research: Can You ‘Train’ Yourself to Have More Willpower? You can train your body, your mind … and your willpower? 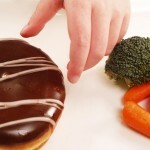 That’s according to a new study by researchers at The Miriam Hospital’s Weight Control and Diabetes Research Center.